First and foremost, you must have a Daum account. If you do not have a Daum account you can click here and follow the step-by-step on how to create one. 1. 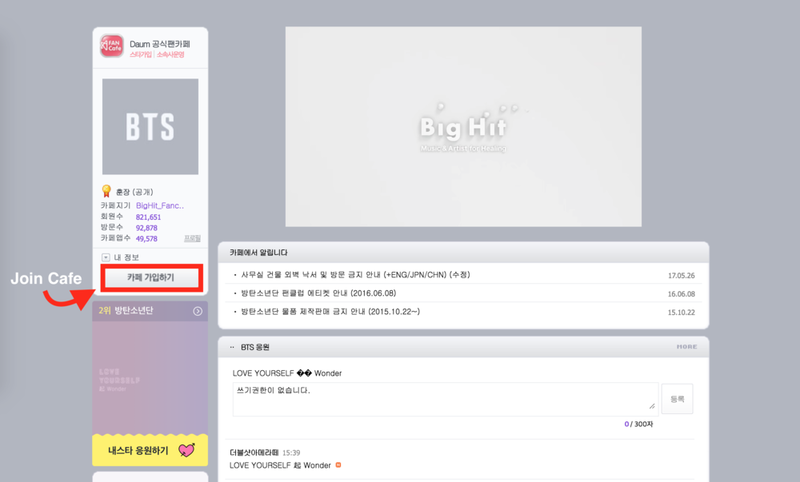 Go to BTS' Fancafe and click on "로그인" (Login). If you are already logged in, you may skip to step 3. 2. Type in your Daum ID and Password then click on "로그인." 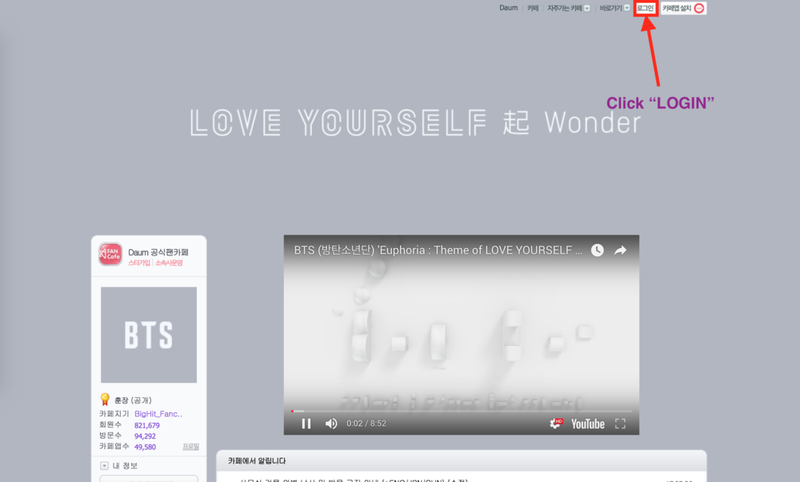 If you do not have a Daum account click here for a step-by-step. 3. Click on "카페 가입하기" (Join Cafe). 4. Read the nickname rules listed below and then follow the steps shown in the image after. It is very important to double check nickname rules or else you may be demoted without notice! Your nickname is not allowed to have only BTS or members (stage/real) names. You cannot use a nickname that can be mistaken as a staff/admin or official account. Hangul: Minimum 2 to maximum 10 characters. English: Minimum 2 to maximum 12 characters. Your nickname cannot have numbers only. If it's only Hangul + English, minimum is 2 characters or more. *Only pure Korean, English and numbers are allowed. Nicknames cannot have special characters, chinese characters, and/or blank spaces. Separate consonants and vowels cannot be used. Letters that have no meaning are not allowed. Nicknames associated with other artists or fandom are not allowed. In Step 2 of this image you might see one of these while you're entering your nickname. 한글 2자(영문4자)이상 입력해 주세요 = Hangul minimum 2 characters (English minimum 4 characters) or more. 사용중인 닉네임입니다. 다른이름을 입력해 주세요 = Nickname is already in use, please enter a different one.